My time wasting this week was hard to come by. See, I borrowed my brother-in-law’s PS4 and Bloodborne. I’ve only ever played the first Dark Souls game, but loved it. So I couldn’t help but spend most of my time with Bloodborne this week. My journey came to an end on Thursday, and I figured I’d just download a random mobile game to poke away at while watching lore videos for Bloodborne. Let me tell you, that was harder than I thought it would be. No matter what game I looked at, I just couldn’t stand playing it. I went through several trash-tier games like this with no desire to keep going. Then I found Colorblind – An Eye for An Eye. 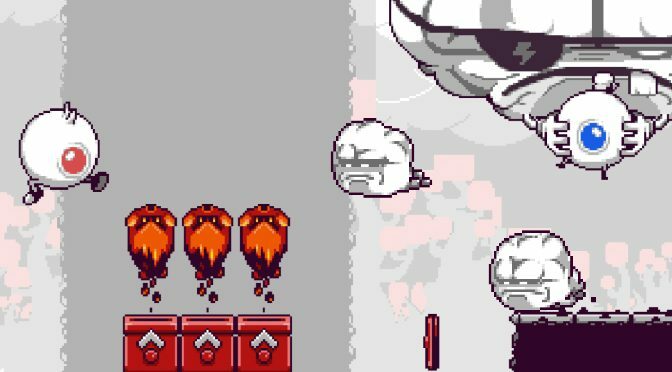 The big reason I gave Colorblind – An Eye for An Eye a chance is because I saw its developer: Nitrome. I’ve reviewed their games in the past and have always enjoyed them. Surely a trusted name like this would keep me entertained, right? 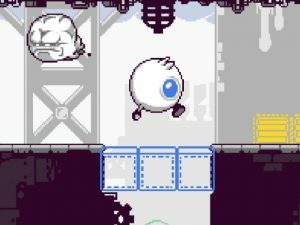 Colorblind – An Eye for An Eye is a puzzle platformer that puts players in the role of a lone eyeball out to save his eyeball girlfriend that has been stolen by an evil thundercloud with an eye patch. 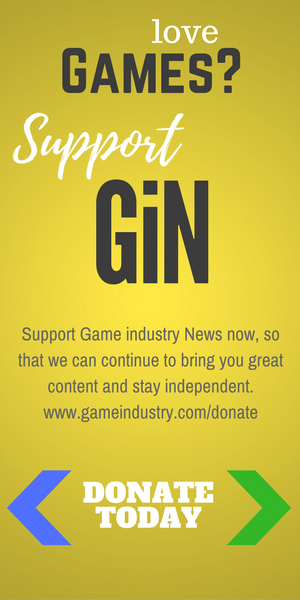 The story isn’t really all that important to the game. It’s just a setting. Something to catch the player’s interest. Rather than what keeps them in the game. What does keep the player coming back in Colorblind – An Eye for An Eye is gameplay. There are lots of color puzzles that players have to solve to progress through the game. These typically aren’t too difficult, but it’s how the game executes them that caught my eye. Our hero eyeball is colorblind, but he can pick up different colors from paintbrushes spread throughout the levels. When he does this, he is now able to see things made of that color. 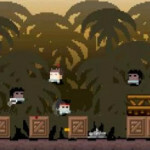 This includes, spikes, enemies, platforms and various other items. However, if our eyeball friend can’t see a certain color, then it doesn’t matter to him. This means players can walk through red spikes and enemies if they don’t have the red color. It also means they can’t use red platforms to move forward, though. Players can also clear all colors from their sight by touching water. You can probably already guess that this makes for some interesting puzzles, but it also does the same for the platforming. There are plenty of instances where players will either have to avoid or touch water at just the right moment to progress. 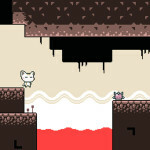 The game also features several blind jumps. These may feel like an aspect of a bygone era, but they aren’t bad when the player trusts the game, which is the case here. He’s a mean, green thundercloud killing machine! I’ve also got to really give praise to the visuals in Colorblind – An Eye for An Eye. The game is basically all gray scale, but items that require certain colors to be seen have dotted outlines. These items then come to life with color when the player touches the proper brush. This is handy for helping certain parts of the environment stick out and gives the game a great aesthetic. 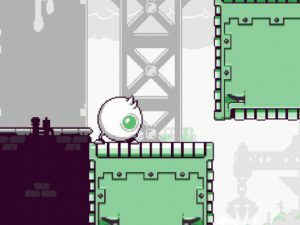 There’s also lots of love and care in the animations, such as how bouncy and alive our eyeball hero looks when moving around in the game. The audio in Colorblind – An Eye for An Eye is also a treat. This includes a main song that plays throughout the game. It sounds like a mix of xylophone and keyboard, but music lovers feel free to correct me if I’m wrong. It gives the game a unique sound that fits well with its visuals and slower gameplay. The sound effects are also spot on and work well with the rest of the game. There’s a lot of praise to be given to Colorblind – An Eye for An Eye, but it isn’t the perfect game. That’s because it’s on mobile. No, I’m not going to complain about the touch controls. They were surprising accurate. Instead, it’s the ads. There’s an ad between every level and after every couple of deaths. Players also have to spend coins or watch ads to unlock checkpoints in the game. Of course, players can get around this by buying the premium version of the game. I won’t actually knock that this time around just because Colorblind – An Eye for An Eye is a great game, but I always have a hard time justifying spending money on mobile games. Either way, the ad count this time around is just a tad too high. Ovearll, Colorblind – An Eye for An Eye is a wonderful way to waste some time. 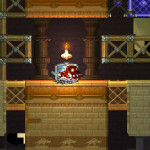 It has solid controls, nifty puzzles and a great visual flair. Definitely check this one out if you’re looking to waste some time during breaks or lunch. Colorblind – An Eye for An Eye earns 4 GiN Gems out of 5!